There is a newer version available in the Palm Beta feed. Get it at http://bit.ly/bbac-b. 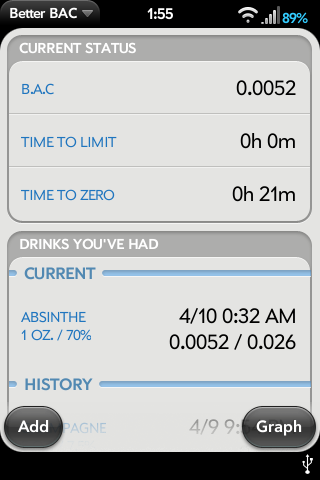 This app calculates and keeps track of your estimated BAC in real time. Add the drinks you've had, and the app will do the rest! Get support and give feedback by emailing me. List of drinks that are still "in your system"
*NEW* Graph your BAC over 24 hours, or through all your saved drinks! I made this app for fun, not for profit. If you appreciate this app, then give your cab driver or designated driver a few extra bucks.